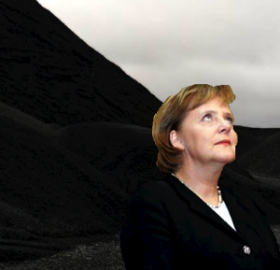 German Chancellor Angela Merkel is believed to be stockpiling coal as part of a plan to impoverish millions of labourers across Europe. Mountains of the fossil fuel have been spotted adjacent to each of the treasuries of France, Greece, Spain, Portugal, Italy and Ireland as Merkel prepares to win control of their money supplies. If Eurozone countries fail to sack swathes of their own public sector workforce it is feared the central banks at Europe’s most indebted nations have now stockpiled enough coal to avoid raising any taxes on the rich. On returning from an EU Summit in Brussels yesterday, French media reported how President Francois Hollande discovered a mountain of coal outside The Trésor Public in Paris big enough to keep the lights of the country’s economy on over the winter and perhaps much longer. The mountain was also being protected by the German army, Deutsches Heer. Merkel made clear at the recent meeting of the EU Council that she wanted to assume control of national budgets to make sure governments weren’t doing anything even vaguely sensible in response to the ongoing Eurozone crisis. “There is no such thing as society,” Merkel told her own parliament in Berlin prior to the summit. Hollande said he was against any new centralised budget-control powers and argued that under-performing countries in the Eurozone should be loaned money without being forced by the European Central Bank into sacrificing their ability to dig for unpaid taxes. “We will pave the way for a transformation and roll back the years of Merkelism,” the French president continued telling Le Monde in what appeared to be a call for continental strike action, despite not balloting for it. In Britain, Prime Minister David Cameron said he once had a poster of Merkel in his bedroom but refused to comment on whether or not he ever wanked over it.